Hi crafty friends! 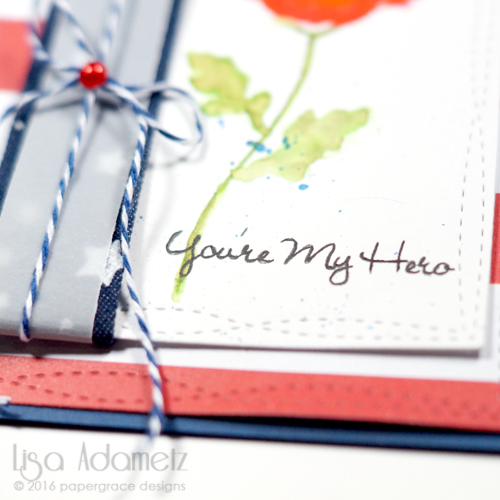 It’s Lisa back on the blog today and it’s Veterans Day here in the United States and a lot of people have the day off. Some are shopping or sleeping in or just enjoying having the day off. But, I *AM* actually a Veteran of the United States Air Force and Latisha Yoast’s husband is active duty Navy. Veterans Day pays tribute to all American veterans–living or dead–but especially gives thanks to living veterans who served their country honorably during war or peacetime. I made today’s card to give thanks to all of our great nation’s Veterans. And I hope you like it. The poppy was stamped and watercolored and at the end I added some black Enamel Accents around the center of the flower. Once it was dry, I added some blue pigment powder to my work surface and a little water. I picked this up with a paint brush and splattered it over the painted poppy. The sentiment was then stamped. A few dots were added with a white gel pen. The panel was die-cut. Around the left edge I added dark denim ribbon with white stars and adhered it using the E-Z Runner® Ultra Refillable Dispenser. A piece of vellum was cut and adhered to the back side using the same adhesive. Finally, a piece of twine was wrapped around on top, tied in a bow, and stiffened with the decoupage medium. And a pearl was added on top. A piece of patterned paper was die-cut and adhered using the E-Z Runner® Ultra Refillable Dispenser and adhered to my card base. Then the piece with the poppy will be added. Just a few pieces of Thin 3D Foam Squares Mix White to the back of the panel before adhering and it’s ready to go! This entry was posted in 3D Foam Squares, Cards, E-Z Runner® Dispensers, Fall, Permanent Adhesive, Seasonal Craft Ideas, Tutorial and tagged Bazzill Basics Paper, E-Z Runner Ultra Refill, E-Z Runner Ultra Refillable, HH Double Sided Tape Runner Refill Ultra Strong Permanent, Jen Hadfield, Lisa Adametz, My Favorite Things, My Mind's Eye, Ranger Ink, Thin 3D Foam Squares White, Twine, Zig. Bookmark the permalink. ← Create a Jar Lid Ornament with 3D Foam Christmas Shapes! 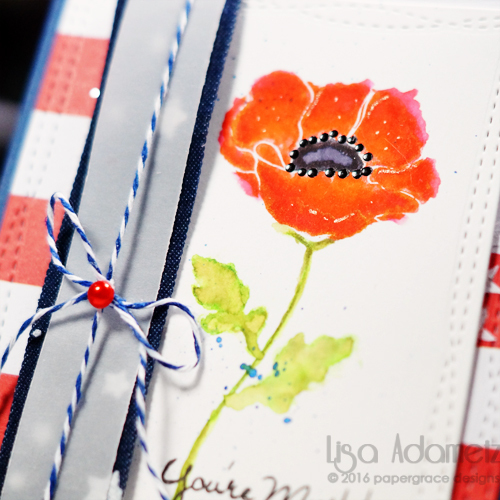 2 Responses to "In Honor of Veterans Day by Lisa"
What a beautiful card and a wonderful way to honor our Veterans. 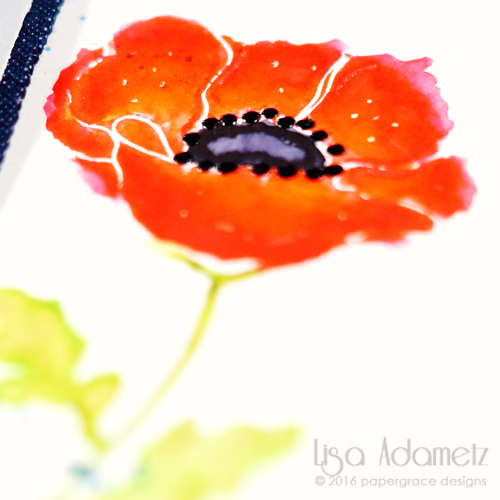 I just love poppies and think they are the perfect representation for this occasion. I remember when I was a little girl buying poppies from the local VFW for me and my friends. We would wear them proudly since most of us had Veterans in our families. A special thank you to you and to Latishia and her Husband for all you did and do for this wonderful country of ours. God bless all our Veterans past, present and future and God bless America!